Harry Potter actress Bonnie Wright announced today that she completed work on her most recent project, the film adaptation of John Banville's novel, period drama The Sea, which was shot in Ireland beginning in September. Bonnie played the character of Rose, the nanny of two young children, named Chloe and Myles, featured in the story. 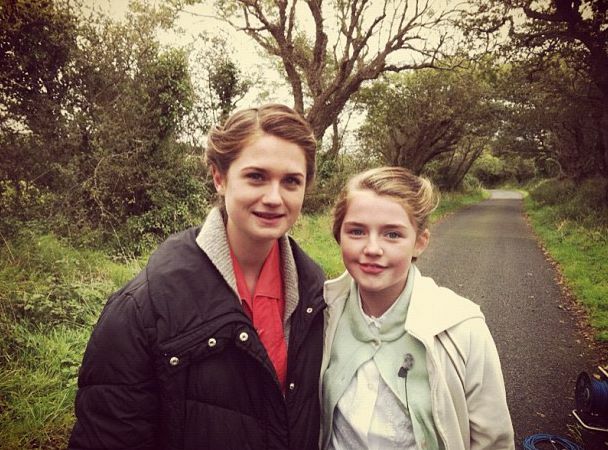 The actress portraying Chloe, Missy Keating, released the first-on set photo of herself with Bonnie in costume from the Ireland set, which can be seen below. There is currently no set release date for the movie. Up next for Bonnie will be promotions for charity organisations of which she is an ambassador, including headlining an event to discuss the documentary feature "1.4 Billion Reasons" by The Global Poverty Project, in Manchester, UK, on November 1. More information on Bonnie's involvement and the event can be found here, as well as a way to acquire tickets. Ooo when is this gonna be out? Very nice picture. I wonder when the movie will be coming out. Love it! I am so glad that she is accomplishing so many things these past months! Amazing when we will be actually able to see these movies and soon! Love the hairstyles each actress is sporting! Absolutely amazing ! I love the photo...and very happy for Bonnie!